Phoebe Comes Home, Take 2! I am cross-legged on Phoebe’s little canopy bed listening to the rhythm of her bi-pap machine while she dreams away right next to me. She’s home again, this time for a week! Nathan had her all gussied up and ready to go when I arrived with the boys and she was so excited. When I walked in to the elevator before her, she whimpered “I wanna go too”, she was nervous I was leaving her there. Poor thing. She giggled all the way out the front doors of the hospital, said goodbye to her friends at the front desk and we were on our way. 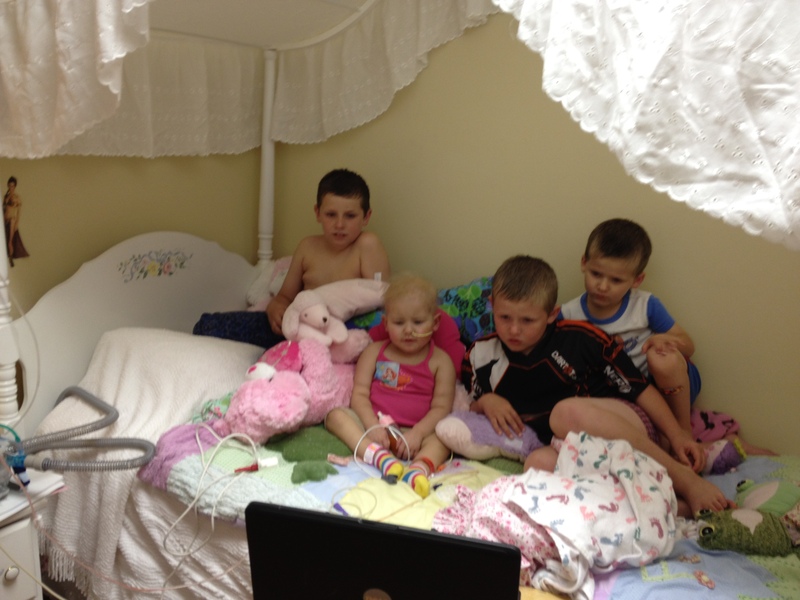 The boys piled up in her bed tonight and the four of them watched Gilligan’s Island, a favorite around here. It was a perfect evening at home. I can’t believe all of the equipment Phoebe has in this room. Two home-health providers came by tonight to drop of her oxygen and bi-pap machine and show us how they work. I was so nervous about going home last time because I wouldn’t have monitors to know her heart rate and oxygen saturation, and now I have both. 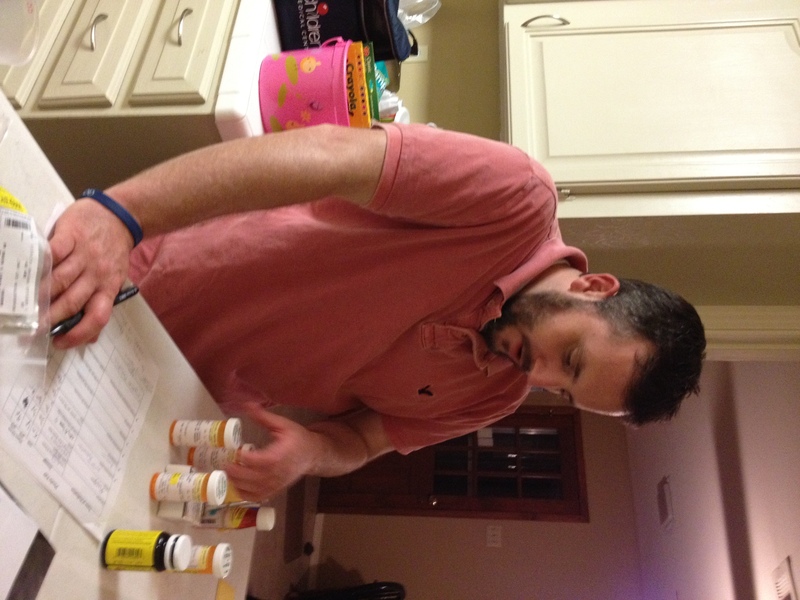 Nathan has the med-table all set up again complete with sticky notes noting the times to administer them. We will be giving meds at midnight, 3 am, 5 am and 8 am…*yawn* and it’s worth every bit of it! I am praying that we will really be able to make this time special for her by taking her out more and doing fun things. A friend of mine from highschool sent us tickets to the Dallas Aquarium and I think that will be the perfect thing for us to do with her while she’s home. She can sit in her stroller and still see the sights and it should be fairly easy for us to give her meds in that situation. As we were driving home this evening I looked in my rearview mirror, and I saw four beautiful faces in my backseat. Phoebe was studying the world outside her window with wonder and the boys were jabbering happily. Tears of gratitude welled up in my eyes and I took a deep breath and whispered “thank you Jesus”…to have that one extra little body warming that often empty seat is such a feeling of completeness. I remember several weeks ago when everyone was taking their Spring Break vacations, I would scroll through facebook and see the status updates: “Having such a wonderful time at the beach with the kids!”, “On the slopes today!”, “The car is all packed and ready to go!”. I felt so “stuck”, for us it was another week of homeschooling (why take off when we can’t leave) and hospital duty. But THIS week will be our Spring Break! Phoebe is home and we can make a week full of fun right around here. 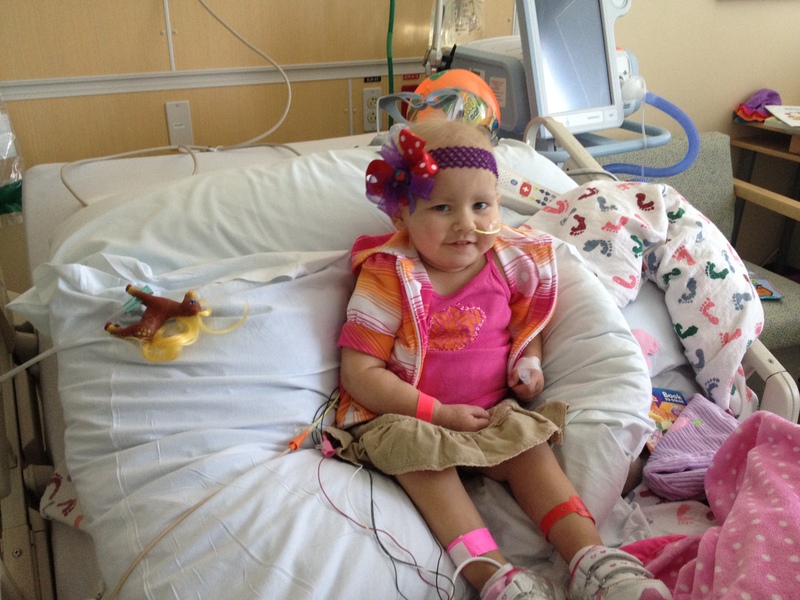 This week is for making memories and helping Phoebe rediscover life outside of the hospital! So glad she got to go home. Praying everything goes well. Have a GREAT time!!! We never stop praying for y’all!!! Happy Spring Break!!!! Take every minute off it and have a great family time off! We pray that everything goes well mit the six of you!!! My eyes are pouring tears of joy. The photos and your post were just beautiful. Thank you Jesus. I love the photo of all the boys in bed with Phoebe. In the midst of my cancer being resistant to all the chemos, I too, had an approval………. from my neurologist, so I get to drive again. Thank you Lord. I have felt so confined, lately. There is a whole new perspective on life, when we are living around treatments and side effects. I feel so liberated. Free at last, free at last…….I just drove to the gas station………with my dogs in the car. My dogs were so excited to get a change of scenery, too. I’m sure Phoebe feels confined at times, too. Her little voice requesting to go, too. I am so happy that she heard the words that stirred her heart. Enjoy having your entire family together. It’s the little things that count the most. Praise the Lord. Praying for a wonderful and calm week. Just some really grt family time. Will be praying here in Ga for continued healing. Happy Spring Break Fair Family. Have a wonderful spring break! So happy to read she is home this week! Love and prayers. Yay …. So happy for ALL of you. I hope the week goes well and Phoebe feels good every minute. Enjoy! Everyone of you deserve it. Another huge victory for the Fair family thanks to our gracious heavenly Father! So happy for you. Have a wonderful time! Praise God! Have a wonderful spring break. Amey, I’ve been following your story from almost the beginning, and this is one of the very few times I’ve cried with happiness! 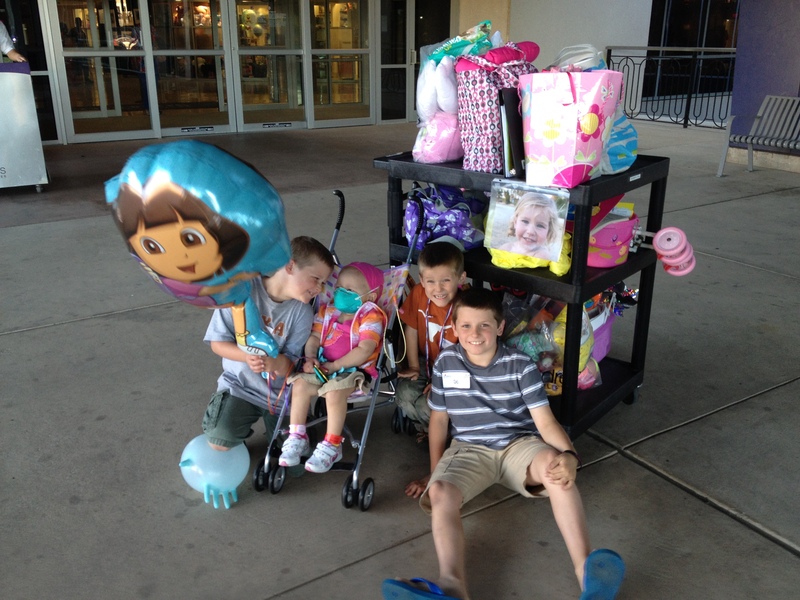 To see the pictures of Phoebe with her brothers is priceless – especially the one with all the gifts and goodies outside the hospital. The adoring way those boys look at their baby sister is truly to see the face of Jesus, smiling down on your family. God bless you all as you enjoy this amazing week at home with Phoebe. I am praying that nothing changes for her medically that would cut the visit short, and also that this will be the first major step in getting her home permanently. You and Nathan are also in my prayers, that despite the lack of sleep you’ll likely experience, it will be one of the best weeks you can remember with your family…ever. Yes, praise the Lord for each victory! How wonderful you’ve been able to bring Phoebe back home and spend an entire week with her. Enjoy each and every moment of it. I’m so happy and excited for you. I couldn’t hold back the tears of joy reading your update this morning. I am so often overwhelmed reading your updates, feeling your emotions but most of all knowing your faith and testimony during this unimaginable time is reaching thousands! Yay!! So happy for you all! Kept checking in yesterday to see if Phoebe was able to come home…I am so thankful that you guys will get to have this time. Have a wonderful Spring Break – we’re even having some wonderful weather for you all to enjoy throughout this next week. We love you and are praying for all of you. I am so happy for all of you (especially Phoebe) that she is home for a while. Enjoy every Blessed minute. God is Good all of the time. I love how excited they all look!!!! YAY PHOEBE! Rejoicing with you!!! Praying that Phoebe feels good the whole time she is home and wonderful memories are made. Love this post!! So happy for you and your family! Praying for you all to have a wonderful week! Thank You God, that this precious family is all together! Amey, you and Nathan are AWSOME parents. No question, God is smiling down on you all! Have a blast this week with precious Phoebe!!! Praising God for Phoebe’s victories and your family time together! SOO excited to see this!! Those boys all look just as happy as she is. 🙂 So great that they enjoy her so much. I must say my eyes joined you in the tearing up as I was reading this. Love of love and blessings for an AMAZING week for you guys!!! Amazing!! Tears are just a flowing for you all! Happy tears!! Yeah!!! So happy you get to have your precious girl home with you! We are wishing you a beautiful time together this week and sending our love to all! We are praying for a healthful “spring break”. May the beauty and new life that buds in this spring season bud forth in Phoebe and your family as you soak up this time together. Our family is rejoicing with you! Love you guys! I am so happy for you and your family. Praying and praying for a fantastic week with no issues at all. Happy tears. We like happy tears. And can I just say that the boys are all so great!? And Ben is looking WAY too grown up! Phoebe Girl, you enjoy your room and your bed and your brothers and your house! Nathan and Amey, you are constantly in our prayers. Bob has often preached that the biggest trials come to those with the greatest faith, and I whisper to the Father, “My faith isn’t big enough, please, my faith isn’t big enough.” Apparently He thinks your faith is big enough. For the days of trial and for these days of joy. Keep on walking. So happy for you all hope that you all have a week full of fun and excitement that keeps you away from the hospital! Lord may you grant this to this family help Phoebe see light and know that you are healing her little body, please give them wonderful week of sure blessings. We are thanking Jesus with you! Averie said this morning, “we care about Phoebe so much, don’t we?” sweet. Praying for an amazing week with no interruptions! Love you! Tears of joy for your family!! Praying for an amazing spring break for your family! Lots of tears of joy here also!! I waited up last night wondering if Phoebe got to come home. I’m from California so i’m 2 hrs. behind you, but still hadn’t heard anything when I went to bed. So glad to see the pics and post this morning. Phoebe looks so good and more herself now. I hope you all have a wonderful time together this week. I’m so happy and overjoyed for all of you…..God is good and listens to our prayers every day and i’ll keep on praying for her strength especially and for complete healing. Enjoy your week! Brought HAPPY tears to my eyes seeing the boys in the last picture smiling with Phoebe sitting outside the hospital getting ready to leave. I am so happy for your family getting to bring her home and family time…all of you! Praising the LORD in CA over the great news that you are all home and together once again! So excited for you. Maybe I will see you May 1. Love and prayers from Trey and I AND our Sewell bouquet of kids. I’m so happy that y’all are able to spend some precious family time together. I teared up when I read this entry, as they do whenever I read any entry. Texas 4000 continues to ride every day for your family, as we will for years to come. I am so sorry to hear Phoebe had to go back into the hospital today, but at least we know she will be well cared for there. It is nice you were able to spend the day with your boys, doing fun things. I pray for strength for you Amey, as you must long for being 2 or maybe 3 people, 1 to be at the hospital with your baby, and one to be doing fun things with your boys, and one to just be held and supported by Nathan.